The TME/Team Gazoo IS competed in the first of seven four-hour endurance races. One six-hour and a 24-hour race complete the nine-race series. 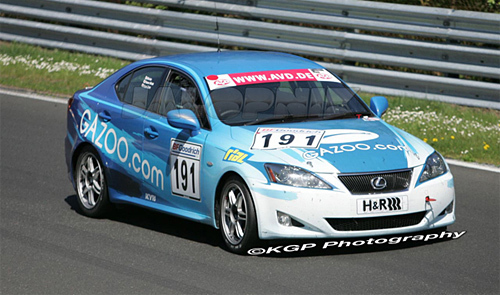 The newly identified IS race car is registered as a Lexus IS 250 in group SP5. Group SP5 consists of cars between 2.0- and 2.5-liters, with a minimum weight of 2,270 pounds. The race-prepped IS logged a fastest lap of just under 10:58, and an overall finish of 95th place with 21 laps covered over the 4 hours. The much-mentioned engine bulge was nothing but a camouflage trick, which admittedly worked very well. Too bad the subterfuge didn’t translate into a better finish.